Belize has become popular for many reasons - the world’s second largest barrier reef, vast pristine jungles filed with ancient Maya cities and exotic wildlife, an unspoiled Caribbean coastline and more. And now, according to The Lodge at Chaa Creek, more and more travellers are going underground to discover the little country’s immense, fascinating network of caves. With Belize’s vast network of caves attracting more travellers and media attention recently, The Lodge at Chaa Creek has launched a series of new Belize Caving Adventure Vacations to introduce visitors to the little country’s immense underground attractions. Chaa Creek marketing administrator Roberto Harrison said that profiles such as a May 31, 2018 article in Forbes magazine’s Lifestyles section, “The 8 Most Amazing Underwater caves In The World,” featuring The Great Blue Hole on Belize’s Barrier reef, encouraged Chaa Creek to combine various cave tours into one all-inclusive Belize vacation package. “We continue to offer day trip excursions and tours to the most popular cave sites, and with interest growing in Belize’s phenomenal cave network we recently decided to offer three, four, or five night all-inclusive Belize vacation packages dedicated to exploring Belize’s subterranean attractions,” Mr Harrison explained. “We also offer several ways to visit the Great Blue Hole, either as part of a stay at Chaa Creek, The Macal River Camp, with Chaa Creek’s Belize Expeditions, or with our Unique Hotels of Belize partner resort on Ambergris Caye. “Whether a guest’s interest is Scuba diving, snorkelling, sightseeing from a boat or the sky as part of a helicopter tour over the Belize Barrier Reef, we can make it happen,” he added. While the Forbes article focussed on underwater caves, Mr Harrison explained that the Great Blue Hole it featured is just one part of Belize’s massive network of caves and sinkholes. 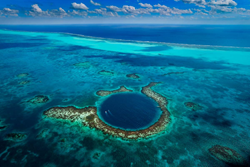 Mr Harrison said not many people are aware that the Great Blue Hole, an enormous underwater sinkhole off the Belize Barrier Reef, is actually a huge cave sitting on its side. Examination of the stalactites inside the Great Blue Hole showed that the cave was dry when they formed over 150,000 years ago when local sea levels were much lower. As water levels rose, the huge cave was flooded in four successive stages, creating ledges and other features divers find fascinating today. “Jacques Cousteau’s research aboard the Calypso at The Great Blue Hole in 1971 spurred global interest in what is now considered one of the world’s great natural wonders, and that’s led to interest in Belize’s other underground attractions,” Mr Harrison said. And, he added, you don’t need to be Scuba certified to explore Belize’s other caves and sinkholes. “One of the caves on our itinerary is Actun Loch Tunich, or “The Mother of all Caves” to the ancient Maya. Also known as “The Black Hole Drop” it’s the inland equivalent of the Great Blue Hole; a massive sinkhole that, instead of diving, you rappel into, sliding down ropes some 200 feet (approx. 61 metres) to the forest canopy deep inside, and then another 100 feet to the bottom. It’s quite an experience,” Mr Harrison said. Also on Chaa Creek’s caves adventure itinerary is the fascinating Actun Tunichil Muknal, or ATM, an ancient Maya underground ceremonial centre where pottery, artefacts including jade axe heads and implements from sacred rites such as royal bloodletting, and the skeletons of human sacrificial victims -including the famous Crystal Maiden, can still be seen. The ancient Maya considered caves to be the entryway to Xibalba, an underworld ruled by fearsome deities who affected day-to-day life. During times of drought, poor harvests and hunting, ill health or other misfortunes, shamans and members of the ruling class would perform sacred rites and ritual sacrifices to try to appease the gods. Some Mayanists have linked activity at Actun Tunichil Muknal to a long drought that contributed to the collapse of the ancient Maya Civilisation. Other Chaa Creek caving expeditions include a mile long canoe paddle though Barton Creek, another ancient Maya ceremonial cave known for the natural beauty of cathedral-like chambers and passageways. Another flow-through caving adventure, Caves Branch is also popular for inner tube floats, and close to Chaa Creek is Che Chem Ha, which was discovered by a neighbour’s hunting dog and is filled with ancient pottery and other artefacts. “Rio Frio Cave, up on the airy Mountain Pine Ridge, is a pleasant day trip when combined with a picnic swim at the beautiful Rio On pools and a refreshing, chilly dip in the aptly named Rio Frio,” Mr Harrison said. Chaa Creek’s caving adventures are available as individual day trips, in combination, or as an all-inclusive Belize vacation package in which everything; accommodation, all meals, access to the amenities within Chaa Creek’s 400-acre private nature reserve including a farm-to-table restaurant, infinity pool, Hilltop Spa, Natural History Museum, butterfly farm, and more, is included. “Belize has become popular for its Caribbean attractions, jungle experiences, ancient Maya culture, and wealth of outdoor activities, and now more people are discovering a whole new world below the surface. And the best part is, it’s a surface we’ve barely begun to scratch,” Mr Harrison said.